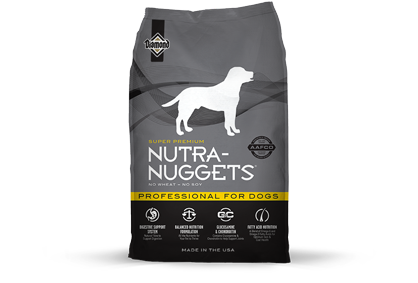 Nutra-Nuggets Professional Formula is formulated to help promote the performance and health of hardworking or show dogs. This highly digestible formula is also beneficial for pregnant or lactating females. High-quality protein and fat sources help support all-day stamina and strength, while added glucosamine and chondroitin help maintain healthy joint function. Chicken meal, ground maize, brewers dried rice, chicken fat, maize gluten meal, dried plain beet pulp, egg derivatives, chicken digest, fish meal, linseed, glucosamine hydrochloride (0.03%) and chondroitin sulphate (0.01%). Nutra-Nuggets Professional Formula for Dogs is formulated to meet the nutritional levels established by the AAFCO Dog Food Nutrient Profiles for All Life Stages.